Medical imaging is a powerful clinical tool in increasing demand, but the field is experiencing global personnel shortages and unmet needs for diagnostic accuracy. The industry-wide shift to a team-oriented, value-based environment brings new opportunities and pressures. The result is a strong need for innovative solutions that can improve the accuracy and efficiency of medical imaging workflows ...and enhance collaboration across the healthcare enterprise. Vendor-neutral archives (VNAs) and artificial intelligence (AI) offer powerful new ways to address these objectives. VNAs bring imaging data out of its departmental silos, improving collaboration and efficiency and creating a basis for next-generation analytics. AI allows for exploring massive amounts of data in search of correlations and patterns that may be too subtle for clinicians and researchers to observe otherwise. Integrating AI capabilities with data from VNAs can unlock insights at the intersection of longitudinal, multi-modality, and multi-vendor imaging data across applications. These insights can be incorporated into practical solutions and integrated with picture archiving and communication systems and other imaging workflows. There, solutions can help streamline clinical productivity, enhance diagnostic accuracy, increase operational efficiencies, and promote the delivery of value-based, collaborative care. 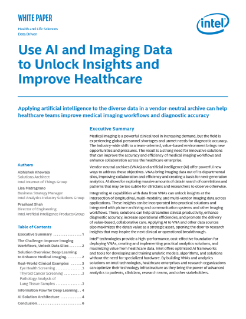 Applying AI to VNA and other data sources also maximizes the data's value as a strategic asset, opening the door to research insights that may inspire the next clinical or operational breakthrough. Intel® technologies provide a high-performance, cost-effective foundation for deploying VNAs, creating and implementing practical analytics solutions, and maximizing value from healthcare data. Intel offers optimized AI frameworks and tools for developing and training analytic models, algorithms, and solutions without the need for specialized hardware. By building VNAs and analytics solutions on Intel® technologies, healthcare enterprises and research organizations can optimize their technology infrastructure as they bring the power of advanced analytics to patients, clinicians, research teams, and other stakeholders.